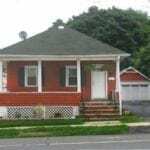 Porch skirting mistakes – the lattice under porch is an important component of your porch design. This is an area today where many mistakes are made. Learn how to recognize and avoid porch lattice mistakes. See some other porch skirting ideas too. 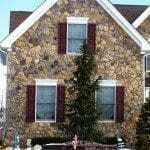 So read on to get the best curb appeal for your home. The area under the front porch (or mud room) is referred to as a Porch Skirt or Porch Apron. The porch fascia board or skirt board directly under the porch floor, transitions the porch to the porch skirt. The porch skirt, like the foundation, visually anchors the house to the ground. The foundation appears strong since it supports the full house and is composed of stone, brick, or decorative concrete block. The porch is a lighter appearing structure and therefore has a lighter feeling base – the porch skirting. 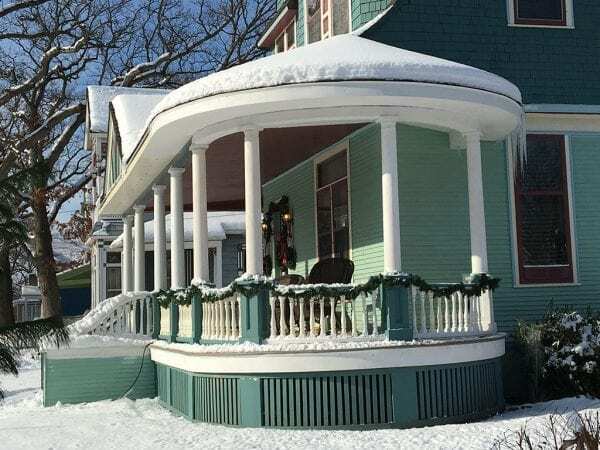 Besides being a decorative element on a house, the porch skirt must provide ventilation and prevent leaves and debris from entering under the porch. Good ventilation will add years to the life of a porch floor exposed to the weather. We will discuss various porch skirting ideas later. 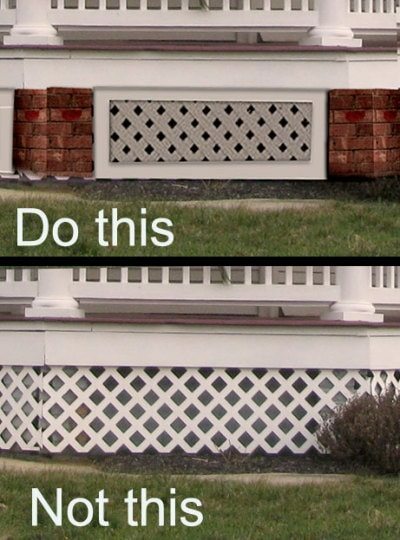 The most common porch skirting is lattice. Unfortunately this is an area that many homeowners neglect. Unconcerned with the appearance, they attempt to take the easy way out. This mistake results in a capital T for Trashy! So read on and learn how to make your porch skirt add beauty to your home. Lattice Under Porch – What Size? 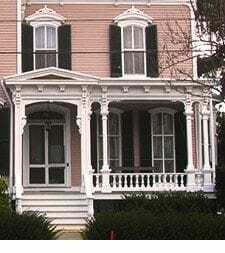 Porch lattice is constructed of long wood slats crossing over each other. The spacing of each slat determines the size opening or hole. 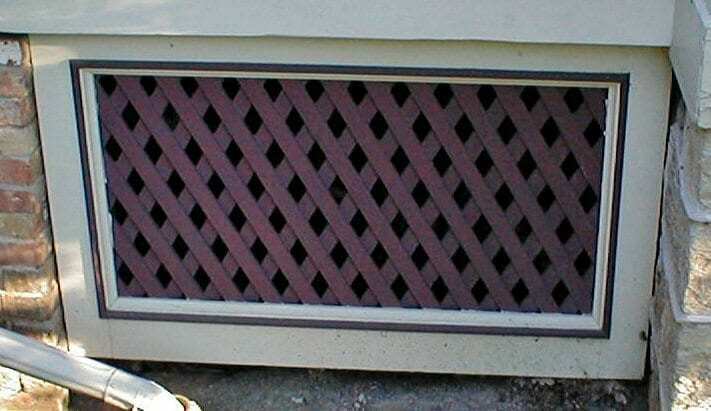 When using lattice under porch, the first issue is the size of the holes in the lattice design. The type of porch lattice most homeowners are using today have holes that are entirely too large. The size of the holes are really very important. Too small and it looks optically strange and make you dizzy. Too large and it appears too bold and attracts your attention. When looking at a house, your attention should be attracted by the porch entrance. The porch skirt should NOT be the focal point of your house or jump out at you for attention. Unfortunately this happens a lot today. Don’t believe me, drive around and see how your eyes are attracted to that white shinny plastic lattice with giant holes. 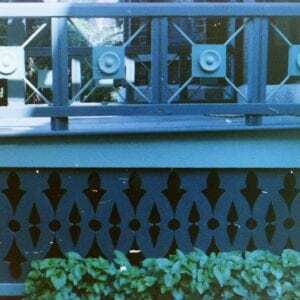 Lattice with giant sized (2.75 x 2.75 inch) size holes sold as Garden Lattice – this is too large and bold looking. This is what most homeowners are using and it looks absolutely awful. In addition the large openings allow leaves and debris to enter beneath your porch. Lattice with holes that are too small. How small is small? I have seen ¾ x ¾ inch size and that is absolutely too small. They appear like hundreds of pin-holes and play visual games with your eyes. Lattice with small holes are sold as Privacy Lattice. Lattice labeled as “Privacy” may or may not work depending on the size of the holes. Color also plays an important part. The holes are much more noticeable when the lattice is painted white. 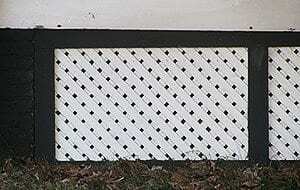 Porch lattice is ten time more noticeable when it is made of shiny white plastic. Pressure treated wood lattice, 1″x1″ size holes and 3″ wood frame. Pressure treated wood lattice. 3/4″ x 3/4″ holes and 3″ wood frame. 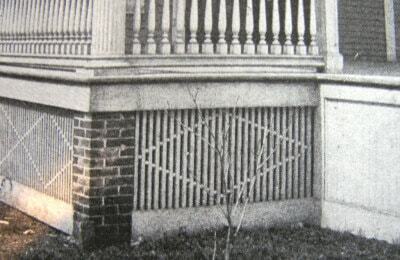 Although both of the examples above of lattice under porch are constructed of wood, the example on the right with 3/4 inch openings, appears too small. The openings seem like small dots from the street and may not provide sufficient ventilation. It’s getting more and more difficult to find wood lattice. Most Home Depot’s no longer carry it nor can you order it from them. Don’t give up. Call your local lumber yard and inquire. Otherwise you may want to choose a different style or construct it yourself. Try Waywood Products for an assortment of wood lattice at stores near you. We all would like to save trees and save ourselves some maintenance, but choosing plastic lattice over wood lattice is NOT the way to go. Real (pressure-treated) wood lattice, is composed of wood slats that are about 1.5 inches wide and .25 inches thick that cross over the top of a second layer of slats going in the opposite direction. The shiny plastic lattice sold is not lattice but merely one sheet of super thin (1/16 inch) plastic with diamond shaped holes punched out. The plastic is etched with a fake grain to look like wood slats to fool you. Funny that real painted wood does not have this fake grain although most people still fall for this trick. There are no shadow lines with plastic lattice of course. It looks cheap because it is cheap. Offering this product to the homeowner in stores is insulting! A 1 inch square hole in wood lattice will look quite different in plastic because of tighter spacing between holes. The slat width for wood is 1.25 to 1.5 inches while the slat for plastic is 1 inch. 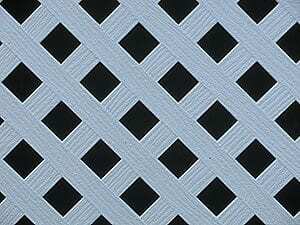 Plastic lattice is merely a sheet of plastic with holes cut out. There are grooves to simulate wood for those that don’t know any better. 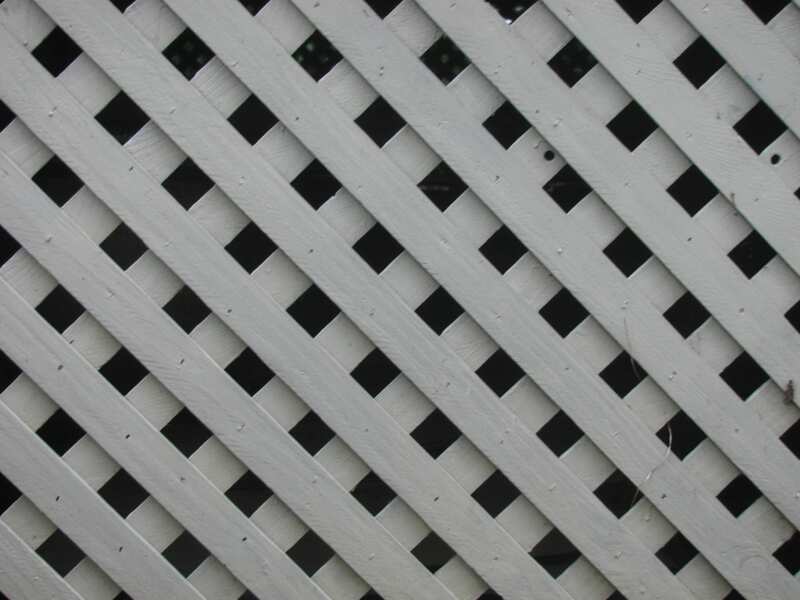 Wood lattice is composed of wood slats. Notice the shadows and texture. 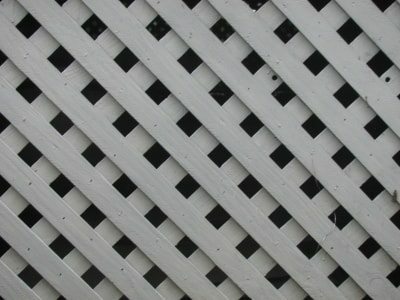 If you really must choose the plastic lattice, you can paint it (usually the base color of your house or a dark color) and it will look a bit better. 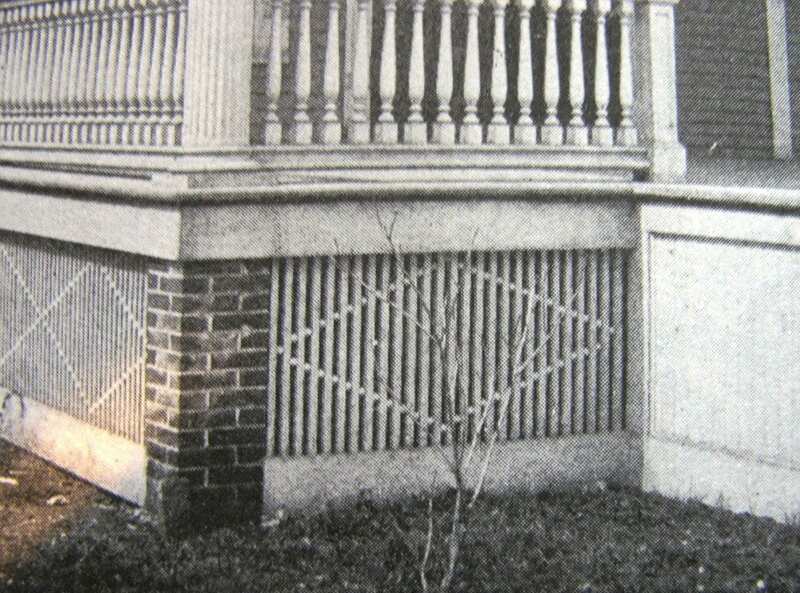 Diagonal or diamond lattice under porch is commonly used, but square lattice having slats that go up-and-down, or other patterns of design can be used. You can easily make your own. First construct a frame, and then create your own pattern with slats of wood. If you construct your own square lattice instead of diamond, be sure the vertical slats are in the front of the horizontal slats. The vertical slats take precedence since they follow the upward flow of the building. Square lattice was also very popular. 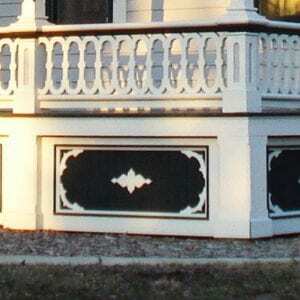 Porch skirts, porch lattice and practically everything in architecture must have punctuation. There must be a visual beginning and end. If not it looks like a mistake – something trying to, but not succeeding to blend into the surrounding area. It looks like it does not belong there. 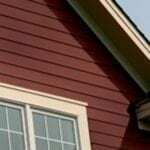 The porch skirt – porch lattice should always sit inside a frame (Do not let the bottom of the frame touch the ground, otherwise you run the risk of rot and termites). The width of the frame should be about 3 to 5 inches depending on the height of the porch etc. If there is a wide distance between piers, consider separating one lattice panel into two or add a piece of the frame wood in the center. 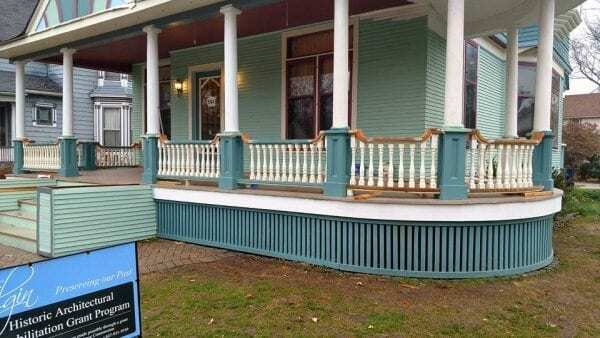 Just because you can buy or make a large porch skirt panel doesn’t mean it will look right. Some porches are low to the ground – sometimes with only several inches of clearance. For this situation you have to make a judgment call. In this case choose the smaller 1×1 inch hole lattice. Make a frame at least 1.5 inch wide (slat width). The lattice is attached to the back of this frame. This frame then sits between the piers (stone, brick, or concrete block column supports) and just behind the (skirt board) porch fascia board. The top of the lattice frame will fit and be held in right behind the porch fascia board. The sides of the frame will be flush or slightly back from the piers. The bottom of the frame can rest on a few bricks to keep the wood off the ground. Each lattice panel may hold in place on its own, but securing them with screws would help. Don’t forget to make one or two removable for access under the porch. Some people use hinges. If you use hinges, make sure the panel swings back under the porch for the panel should sit behind the fascia board not even with it. If so you will lose the shadow line. A front porch is a focal point on a home and it is important to understand and follow these guidelines here. Allow your home to be aesthetically pleasing, and the law of attraction will spread through your neighborhood and beautify the area where you live. If a house is allowed to slowly lose its aesthetic charm, this too will spread. 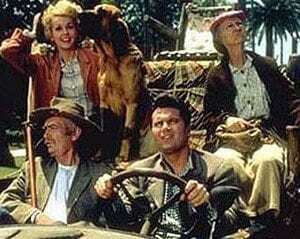 Good neighbors will move as a re-muddled neighborhood attracts the folks below. Don’t let your porch skirt look like this! 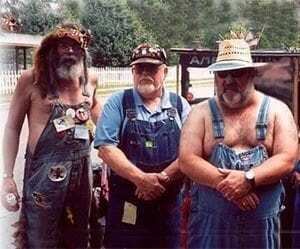 They’re moving to your neighborhood. Neighbors with an ugly porch. Read on to give your house the best curb appeal possible to attract good neighbors! All porches have either stone, brick, or concrete blocks set into the ground to support the porch floor. 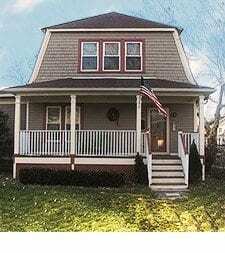 The porch floor then supports the porch columns or porch posts which support the porch roof. These columns or posts are perfectly lined up with the piers below. These piers/column supports may or may not be PHYSICALLY visible but MUST be architecturally visible. Let me explain. Aside from their structural purpose. there is also a visual requirement. To be aesthetically correct, the column/post that is supporting your porch roof needs to be visibly supported by a porch pier or a vertical panel directly below. 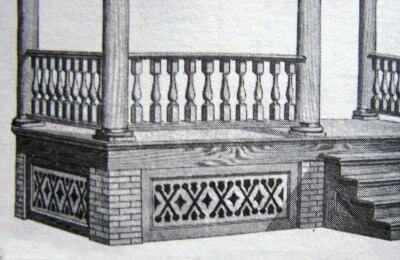 The base of the column or post must not be larger than the width of the pier. The pier can be wider than the column or porch post it is supporting however. If the pier is hidden behind a lattice panel your inner mind will interpret this as unpleasing. There could be a steel girder supporting the porch but your mind needs to visualize a structural support. Click here to learn about the psychology of architecture . The following image is an example of what to never never do. 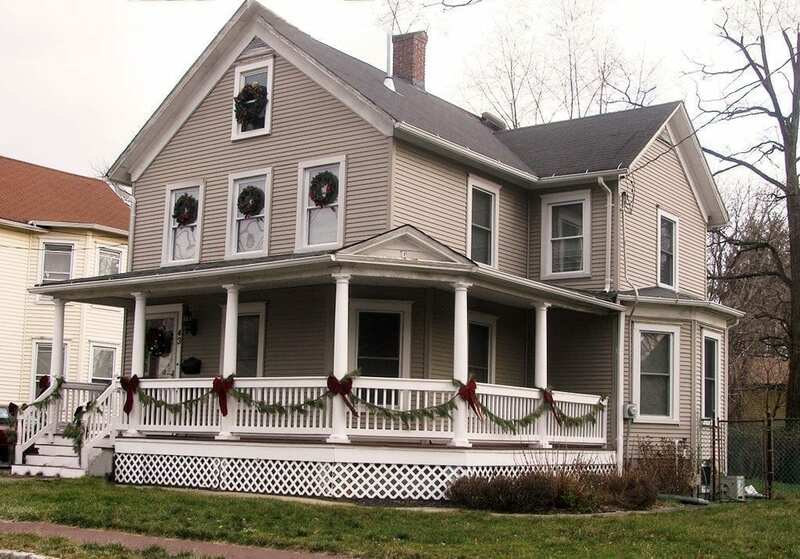 Although the house looks good, it is evident that some homeowners do not care or think about their porch skirting. 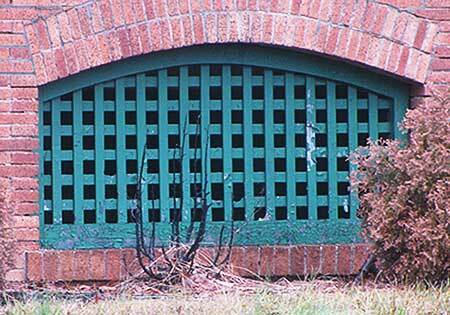 Bad lattice, lack of framing, and hidden piers, have a bad impact on curb appeal. Tacky porch lattice is the focal point of this house. This lattice has a house attached to it! It actually appears like a dust ruffle for a bed. It looks cheap and sloppy. Never cover up the column supports unless there are vertical wood panels to show that support! The next two photos show how properly designed porch skirting can improve the appearance of this house. The following modifications were performed graphically. We can do this for your house too! Framed lattice and exposed brick piers. This very important feature provides a strong visual base for the house and support for the columns. The brick was manufactured in the next town in a factory that closed down in the 1920’s. 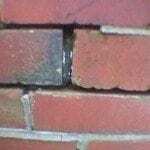 This old unpainted brick has a great patina that deserves to be shown. The porch lattice is now framed with a 3 inch wide wood border which provides a nice crisp looking shadow-line. However – the large openings in the lattice create a heavy feel and detract from the house. They need to be toned down. 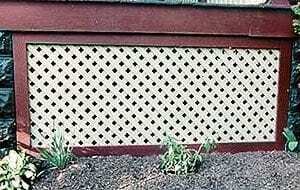 Plastic large hole lattice is replaced with 1.5″ x 1.5″ wood lattice painted the base color of the house. The porch skirting now gives this house curb appeal. 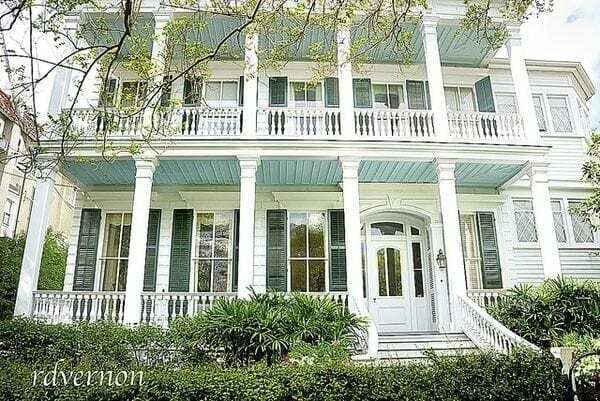 Notice that your eyes are first attracted to the porch columns and balustrades and not immediately to the lattice below. Compare the photos and see the difference. We discussed the important role porch piers play in the architectural beauty of a house. However, piers should not always be exposed. 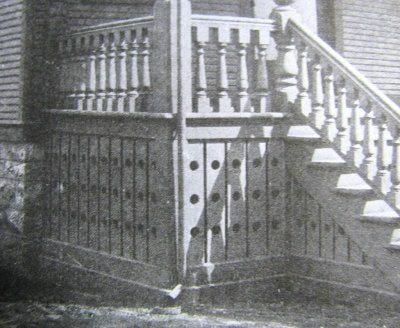 Victorian homes built prior to the Colonial Revival rage mostly had posts instead of columns. These posts are much narrower than a column and piers are (should be for support) much wider than a post. To avoid the look of a pier much wider than a porch post, a vertical board is used as a pier cover. This pier cover board must match the width of the porch column or post at its base just like the piers – never smaller. In the historic image to the right, notice the vertical board below the porch post. In this design it also doubles as part of the frame. The face of this board is even with the porch fascia board. 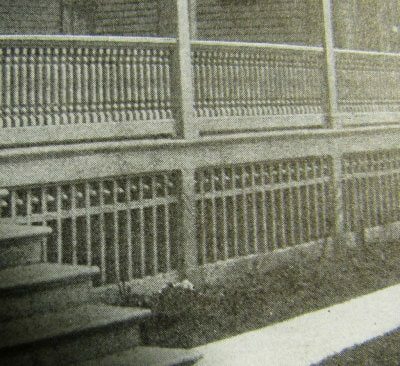 Historic porch skirting with vertical boards under porch posts. Notice the porch skirt. Do not pay attention to the ugly railing. Ignore the ugly railing in the photo above but notice the porch skirt. This house did not have a porch. A professional constructed this porch and look at the awful work he did. He had no clue about design. The image to the right was graphically corrected only by adding vertical boards in the correct places. You now get a feeling of structure. Framing the lattice and replacing the plastic with wood lattice would make more of an improvement. Here is another example where the carpenter fixed the porch skirt. Round porch skirt without pier covers. This is how the porch skirt should look. The pier covers give a nice finished appearance. 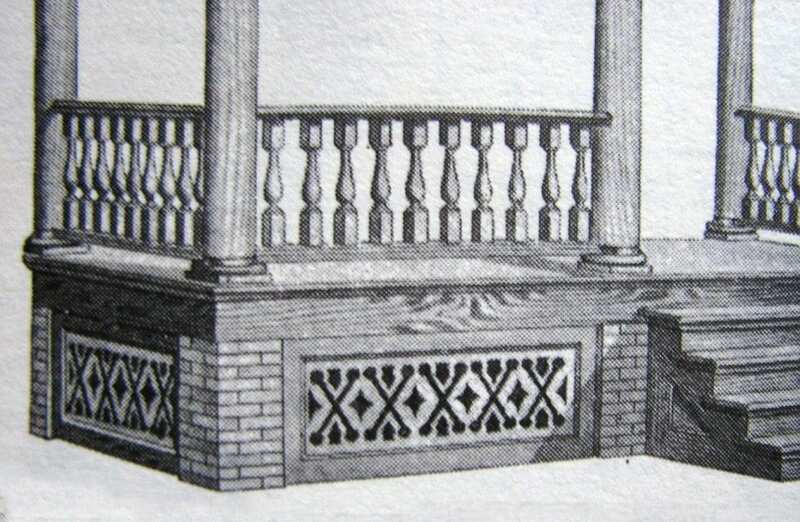 Square lattice and diamond lattice constructed of wood were commonly used historically. 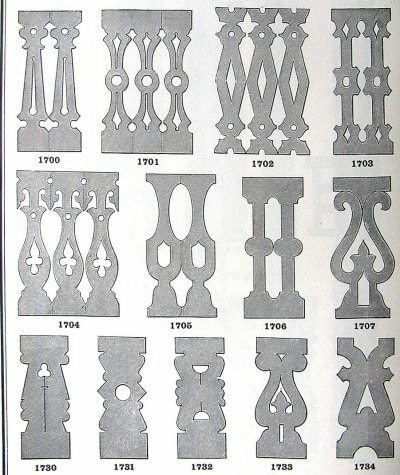 However, there are many more historic options for porch skirting. Below are some examples. 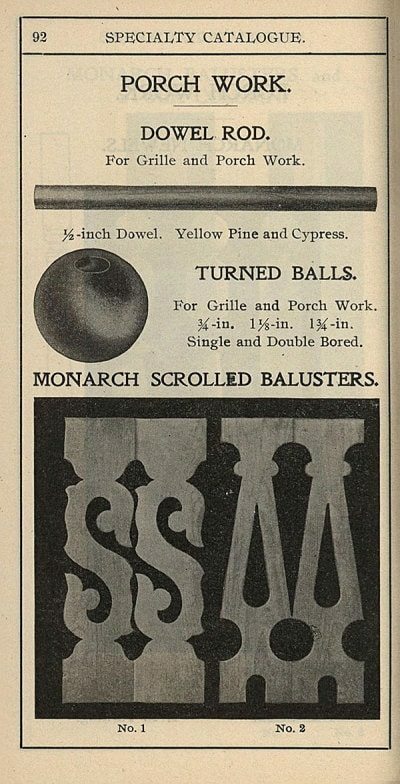 One option is to use sawn balusters in place of lattice. 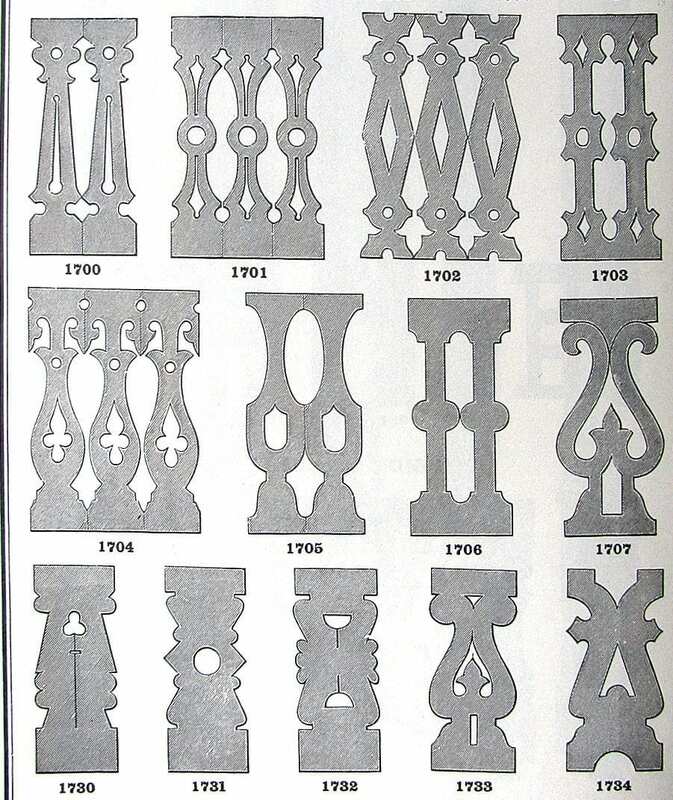 Although designed to be used as balusters, they were more commonly used for porch skirting in the midwest. The following are some samples from various catalogs etc. Some are from a 1903 Millwork catalog and a 1910 Sears Building catalog . Diamonds instead of squares and a routed edge adds a nice touch. The porch skirting is important to the overall appearance of your house. Today it is too often forgotten about and with modern landscaping, hidden behind shrubs. For a more authentic appearance, keep plantings to a minimum. Stick with corner plantings and allow your house to display itself as it was meant to. Do you need help with your porch skirt? Contact us and we can show you how your house can look with a new porch skirt designed correctly for your house. See other Services we offer and visit our Portfolio page . What you need to know about your porch before it's too late! Is your house a Clown House? Building code vs. Curb appeal. Find out what color to paint your porch ceiling. Do You Have Wallpaper on Your House?